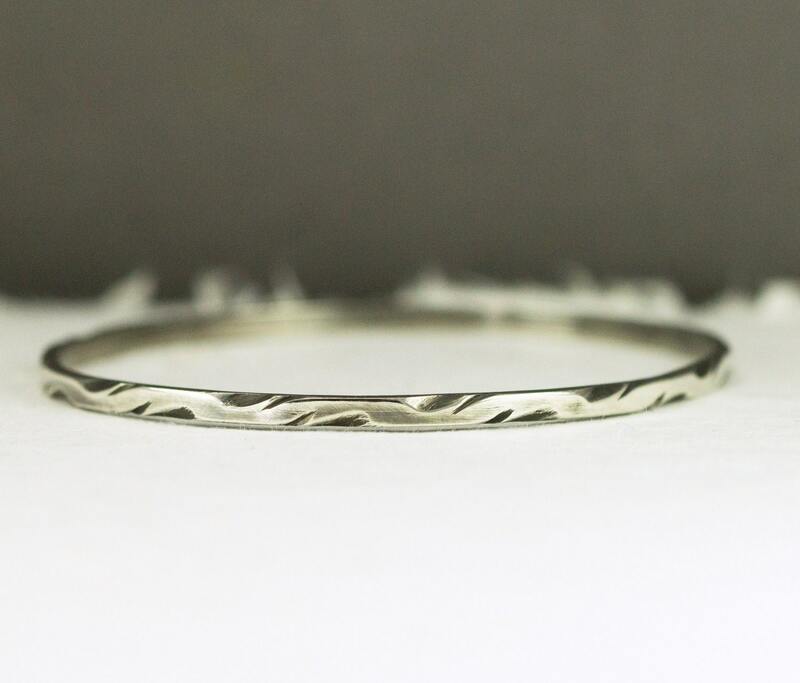 This sterling vine bangle had a trailing vine and thorns pattern created by hand carving using files all the way around the circumference for a trendy boho look. The bangle is 3 mm wide by 2 mm rectangular recycled wire stock. This bangle can be made oval or round in shape. The bangle has been oxidized then polished to show the pattern along the circumference. This bangle is ready to ship in a size large only, depending on what time you order I will ship same or next day. Choose the oval shape if you have a wide hand or swollen joints, this shape is much easier to get over your hand! Please order carefully, this bangle cannot be re-sized. Measure the inside diameter of a current bangle that fits or use a soft tape to measure around the widest part of your hand with the thumb and pinkie squeezed together which gives me a close estimate of inside circumference. Se last photo example. Ever since I found out how much my old big solid gold hoops are now worth, I haen't felt comfortable wearing them for every day. These small hammered solid gold hoops are exactly what I was looking for - especially the clasp design which ensures they will never fall out. Beautiful handmade earrings. I love them! Dainty and beautiful. Great as a stacking ring. I am very pleased with my ring. Dainty and beautiful. I am very pleased with my ring! I accept gift cards, PayPal and Direct Check out where your personal credit cards are accepted for payment. Etsy Gift cards are accepted! I do not accept checks or money orders without prior discussion and only from US banks or US postal money orders when accepted. PayPal allows use of most credit cards with or without an account with PayPal for up to 2 purchases. Custom Orders: I require a minimum 30% deposit on total purchase price on your custom request. Once I have ordered supplies or begun work this deposit is non-refundable. You may contact me to cancel, but it must be before I have ordered supplies or begun your project, ideally within 24 hours after purchase. I am happy to arrange a lay away payment plan for items totaling over $150. Contact me for details. Item must be paid in full before shipping. I request a 30% deposit up front on lay-away orders over $150. Lay away payments are accepted on an agreed upon schedule to be preferably not more than 3 payments total. Longer payment schedules can be arranged for higher priced gold and diamond items. Significant delays in paying on the agreed upon schedule without explanation may cause loss of your deposit. Any layaway reserved for you must be cancelled within 1 week for "change of heart", cancellations after 30 days render your deposit non-refundable. All Maryland residents will be charged a 6% sales tax. My goal is for you to be thrilled with your jewelry and your transaction. If for some reason you are not happy with your purchase, please contact me so we can make it right. I accept cancellations within 12 hours of ordering. I try to start orders as soon as possible so this is time to allow me to put your work into the fabrication flow and ship in a timely manner. Once work has begun or materials have been ordered, cancellations will incur a 20% restocking fee to cover time and materials. Custom made to order is any jewelry made choosing options including but not limited to size, stone choices or metal are not returnable, materials were purchased for your order and they were made specifically for you. If multiple quantities are listed this indicates ONLY that I have enough raw material in stock to make that many of the item- it does not mean there are that many ready made to ship. Each item is custom made to order at the time of the buyers purchase. I can make select items in sterling as a sample for you to purchase and return to avoid costly gold purchases you are unsure the item will work for you. Re-Size: Items ordered in the wrong size are not usually an exchange, they are a re-size. Not all items can be re-sized, this includes engraved rings. If I am able to resize, first re-size is complementary, customer pays shipping both ways. Rings can be re-sized 1/4 to 1/2 size larger. Bangles ordered too small cannot be sized up and a new one will need to be made and additional charges will apply for larger sizes. * Item must be returned/shipped within 7 days and received no later than 14 days, tracking and insurance preferred. Items received more than 30 days after receipt will not be fully refunded. Items damaged in shipping are not refundable so please insure. * layaway, sale, hand engraved, personalized, earrings without a changeable ear wire (posts, hoops) and rush items are not eligible for return unless I have made an error in your order. I will cover all shipping charges of a return for an item "not as ordered" if it's my mistake. Approved refunds are not processed until I have received the item and verified it is in the same new, unworn condition as when shipped. Customs fees are not refundable. Refunds are processed back to your original method of payment. *Delayed returns of any item, including ready to ship, over 30 days are not eligible for a refund. If you are buying as a gift, please notify me in advance so I can adjust the return date. Claims of faulty workmanship, stone damage or errors on my part may require a digital photo for me to authorize a refund. * Exchanges for same or higher price on any sterling made to order item, additional charges will apply for higher cost items. *customer pays shipping both ways for exchanged item. Do get in touch with me if there is a problem! If I have made an error in your order I will make it right and return it to you at no charge, including postage both ways - I will credit your original shipping cost to cover return postage. My goal is 100% satisfied customers. I am here to make what you want, how you want it. Please feel free to ask and discuss and concerns you may have so we both have a very positive experience creating your new jewelry! I ship all in stock items (with no requested changes) same day or within 1-2 days including weekends for the holiday season - no Sundays or US postal holidays. Check my shop announcement for any times I may be away and not able to meet this deadline. Every item will include a tracking number. I strongly discourage using a business address for shipping, mail rooms are notorious for losing packages even if a signature is required. Insurance claim approval and remaking an item takes time, please use a current residential address if possible. Since the 2019 increase of postal rates and new zone pricing by USPS I now use USPS calculated shipping based on size of my mailer and weight (around 3-4 oz) for all first class packages under $100. I would rather buyers see and accurate price breakdown for item and shipping costs than to raise prices to offer "free" shipping. International orders where the country does not have insurance available will only be shipped registered mail to insure delivery. Upgraded shipping is available for all orders, both domestic and international, at an additional charge. Please Note: My shipping charges for Priority and Express are exactly what USPS/FedEx charges for shipping the size, insured amount and weight package I use, zone for FedEx and or signature delivery where applicable. If you have any questions, please contact me in advance. Please make sure your shipping address is correct. If shipped to an old address packages can take up to 6 weeks to be returned to me. If undeliverable- re-shipping charges and return charges will apply. Items returned to me as undeliverable or refused: I will make every effort to contact buyer to initiate re-delivery in case of a "bad address". If I receive no response after 7 days, items will be returned to stock with a re-stocking fee or no refund processed depending on the item. International packages returned as refused delivery to avoid VAT and duties are not eligible for a refund. Items over $500 are shipped Priority or Express insured, signature required in the US and everywhere else. Contact me in advance if requesting delivery with no signature. If using Paypal I will only ship to a confirmed address. ***Customs documents: The contents information and cost is automatically filled in when I generate the shipping label. I will not falsify customs documents. I will not state “Gift” on the package. Ordering an item and marking as a gift does not change the status from merchandise to gift, duties will still be assessed. I fill out custom forms accurately and truthfully, so please do not ask me to falsify information of any kind. ***Taxes and Duties: I am a US seller and my pricing does not reflect VAT included. I am not legally able to collect VAT in the US. Your country may charge a duty or tax on merchandise coming into your country. Taxes or duties are the customer's responsibility when you receive that item. I do not reimburse for any fees, duties, taxes, or other charges made by your country on my products. If your package is lost or stolen but USPS tracking says "delivered", please contact and file a lost package claim with the post office to allow them to research before contacting me and reference your "lost item" claim number. My insurance carrier will not pay any insured amount until they have received verification of loss via a link they will send to the buyer. I must be notified, within 10 days in the US or 4 weeks for international orders of shipping date during the time the records are still available from the Post office. Items delayed in transit contact me and I will file a lost package notification on line with USPS. Ring Re-Size or Exchanges: I STRONGLY suggest getting sized by a professional jeweler before ordering a ring especially in gold. A jeweler will provide an accurate size for you. Wide rings (4mm or wider) may feel tighter and you could need about 1/8-1/4 size larger, for wide rings ask to be sized with a wide ring sizer or try some on to see what is most comfortable. Please do not use string or printable sizers to get your ring size as they have proven to be inaccurate. I offer one complementary ring re-size free of charge if the design allows. Not all rings are able to be re-sized more than 1/4-1/2 so please order carefully. If I have to make a new ring in a size greater than 1/2 the original, additional charges will apply. You may purchase a ring sizer in advance or ask for one to be sent after purchase. My ring mandrel system is checked against standard metal rings used for sizing. If rings are ordered in the wrong size and the ring you have ordered is a design or stone that I am able to re-size the charges below apply if the ring needs to go up more than 1/2 size (or new ring made). First re-size is complementary within 30 days. These sizing costs apply to any ring I must make to a new size because it has a set stone or needs than 1/2 size larger. I hope you will read my listing directions for measuring for a ring, hoops, cuffs and bangles. The customer is responsible for the shipping costs to get any item back and forth for re-size or exchange. Bangles and cuffs ordered too small generally cannot be re-sized. It is always better to err to big which can be sized down easily. Photos of listings are examples unless it is one of a kind and ready to ship. Your item will be made in the exact same style with the same color stone if one is shown. Because each made to order item is handmade there may be slight differences from the photo. Please read descriptions carefully. Having a quantity of any number greater than 1 in a custom made to order listing only means I have enough raw material in stock to make that many. It does not mean it is ready to ship and eligible for a return for full refund. Please ask in advance about returns or exchanges. All items pictured are fully described to the best of my ability, items perceived to be "not like the picture" is not a valid reason for returns. Orders requested with Customer's Stones: I am no longer accepting custom work with customers stones unless it is a stone I can easily replace if a problem occurs. Can you send me photos of ...? Not usually. I am a one person operation so I honestly have very little time to photograph, edit and email photos, I need to be in the studio making jewelry and completing orders! Most all work is made to order meaning I do not have stock sitting on the shelf to do comparison photos of different width, finishes and stone choices. The gemstones I use are clearly photographed in my shop, and you can expect to get a stone that looks just like the stones pictured. All stones are of the same lot and quality and pretty much identical. Color also may vary slightly on computer monitors. I do the best I can to take a representative lifestyle photo for every listing. If an item is made to order, I may not have one in stock to photograph in the particular setting you request. I do not have a model available to shoot photos of every item I make and especially not for an item not yet made and requested as a custom order. Do you offer "certificates of authenticity", appraisals or gemstone certification? In general no. Each of the stones I source is from a Kimberly certified diamond supplier, a certified colored stone supplier or a Fair Trade stone supplier. Each stone I order is graded with color and clarity for faceted diamonds and A-AAA for colored stones according to the vendor. Lab created and stones non graded are noted in listings. Just ask if you need a GIA certified diamond. Raw natural or rough diamonds never have a certificate of authenticity- it is not a standard in the US jewelry industry. Requests for diamond certification from the supplier comes with an extra cost. I am not a GIA graduate gemologist so I will not "make it up" just to give you a certificate. I will give you a quote on the additional stone cost if certification is required or you can have your ring appraised for insurance purposes for your peace of mind. EU buyers, please understand, small colored stone certification is not the standard in the US nor is it in the EU for 1/4 carat or less. DO YOU EVER HAVE SALES OR OTHER PROMOTIONS? Very rarely. I prefer to spend my time making jewelry, so I just set reasonable prices rather than raising them and lowering them periodically. Coupons codes I send out to special repeat customers are my way to thank a customer for their business. I do ask that you use any coupon offered on currently available items in my shop only. If you request a custom design I will give you the best price I can offer for the work. If you accept that price, please do not use a coupon to further reduce the price. Hand engraved and personalized items are not eligible for coupon use. Only on jewelry I have made and sold to the original owner. My main business is keeping my current customers happy by making orders in a timely fashion. Doing repairs on another jewelers items takes my time away from making. Please Note: Both GIA and the US N.R.C. accept that most all colored gemstones are heat treated for color stabilization and that some stones are irradiated to improve color. All stones that are irradiated are tested before distribution in the US. The amount of radiation used is minimal and is considered completely safe. Since this is industry standard it is not noted in my listings, any other treatments will be noted. 1) Free cleaning, inspection, re-polish and re-finish service for the lifetime of your piece. 2) 3 month complimentary setting repair. Setting repair includes tightening of any loose gemstone or diamond and prong re-tipping. 3) 3 month complimentary accent gemstone/diamond replacement. Warranty does not include replacement of stones larger than 0.20 carat. Additional charges will apply to reset larger stones. Flush set stones in bangles and cuffs where flexing the metal to pout on and remove are excluded. Stones will be replaced and reset for 14 days, after that, customer is responsible for contacting me to tighten loose stones or replacement cost if lost. 4) 90-day complimentary ring, chain and clasp repair, replacement of any stones lost due to normal wear that are prong or flush set. Repairs needed from wear after 90 days on sterling and 6 months on gold will have charges specific to the repair. 5) 30 day free re-size on all sterling, sizing down on all gold. All gold rings ordered too small, more than 1/2 size will have additional charges to make a new ring or cover added material. The above services are non transferable and intended only for the original customer or gift recipient. This policy does not cover items that are lost or damaged due to exposure to chemicals, make-up, heat etc. Customer is responsible for all shipping charges. I recommend that you clean and inspect your jewelry regularly; I offer this service free of charge for your jewelry. It is advisable to have your gemstone jewelry reviewed by me every 6 months to allow me to communicate any repair recommendations if any. Failure to complete the recommended repairs or if repairs are made by establishments not approved by me will result in the cancellation of the warranty policy. This policy is not a substitute for insurance so I recommend insuring your jewelry item with a reputable insurance provider. Damage caused by hard wear and tear, misuse, abuse or improper handling or storage is not covered by this warranty. Repair or replacement within warranty period is at the sole discretion of the warrantor. Please get a current size by a jeweler before ordering a ring, especially in gold. Ring size can change in hot weather or if fingers swell. Wide rings can fit tighter than narrow ones. Please do not use string or printable sizers to get your ring size as they have proven to be inaccurate. I have disposable ring sizers in my shop which can be purchased or sent after purchase on request. Select sample rings are available to exchange, if giving as a gift, ask if one is available or ask about my "gifting card". Rings ordered in the wrong size-IF I can re-size, the first is free within 30 days up to 1/2 size larger. More than 1/2 size in gold will have additional charges. Shipping charges both ways is the customers responsibility. *If you are looking for a stone not in my shop, be sure to view the stone in person first. I cannot order stones "on approval"
Ready to ship, yes! Made to order, short answer is no. I make each item to order for you in your size and to your specifications. For custom made to order, I will be investing time and resources to make jewelry just for you. If you find there is an issue with your jewelry, I will work with you to resolve the problem. Ready-to-Ship items may be returned for a refund or exchange minus shipping costs. Contact me within 3 days to initiate a return. In stock rings re-sized at your request to fit you are excluded. Some items are eligible for exchange, Please ask in advance. There may be additional cost for different or larger materials. What is comfort fit and do I need it? All my wedding bands are contoured for comfort, filed and rounded with no sharp thin edges. This is differnt than "true" comfort fit made with a thicker material so the interior is visually domed inside against the finger. Comfort-fit bands are recommended for wide bands over 5mm because they are easier to get over a large knuckle when putting your ring on or off. Since rings made in "true" comfort fit with a dome center are heavier, they cost more. If you don't have large knuckles, my regular bands are very comfortable. You may request any of my wedding rings ordered in a heavier comfort fit, just ask for pricing. If you are unsure, I recommend trying on both styles in person at a jewelry store before purchasing. Are VAT and Duties Included in the Price? I am a US seller, not VAT registered and cannot by law collect VAT or duties. All pricing is minus VAT or duties. If your country charges VAT, duties or delivery fees, these are your responsibility. Please check with your local postal authorities for estimates of any additional costs you may have when importing from the US. Marking as a GIFT does not change the mailing label to gift, it will still show as merchandise and VAT and dutires will apply. Gift only means no invoice with price will be included in the package. What if I'm Not Sure It Will Match/Go With/Be Comfortable? I offer a large selection of sterling rings, bangles and cuffs in the same or similar style and pattern for those who need to "try on" before purchasing expensive solid gold items. I do not make gold rings etc made to size to try on as it would be cost prohibitive. If you cannot get to a jewelry store to try on the style and thinkness of a piece you want to purchase in gold, just contact me in advance to ask if a sterling similar is available. I will set up a private listing for you to purchase and you may return it for a full refund minus shipping within 14 days or keep it if you like. I am sorry but this is not always possible. I make each piece iof jewelry by hand. I do not have large quantity stock items. I photo what has been previously ordered or original samples. I try to show a variety but it is not possible to have all combinations of size, stones and finish and variations of rings or side by sides that could be requested. I will do my best if I have it! It is not usually possible for me to photo your choices together in multi-stone rings. When will you ship? Can I get a rush order? Items in stock, ready to ship: next day excluding Sunday and postal holidays. Custom and made to order: has an expected ship date on the invoice. I normally ship on or before that date. Customer may select a shipping upgrade for faster delivery. Rush orders: meaning made and shipped in less than half the expected procssing time. Contact me first to see if I am able to meet your needs. I will move the order ahead of others and may have to rush order supplies. A rush fee will be invoiced via Paypal to cover costs. All rush order requests must have upgraded shipping to Priority or Express. I lost "X" will you replace it? I provide a 3 month warranty against loss of small accent stones- like flush set diamonds or gemstones. Unless damage is evident, there is no charge for replacement. After 3 months, cost of material is charged.